Duffle bags are universally loved thanks to their complete versatility. Despite the popularity of luggage and suitcases, duffle bags remain a preferred option for travelers. This is because even if you haven't boarded a plane in years, you can still put a travel duffle to use. Trips to the gym, office, or grandma's require something durable to carry your belongings. The advent of the rolling duffle bag has made sporting your favorite style bag even simpler. If you're used to the kind of casual packing that duffle bags have to offer, you don't need to sacrifice that just because you're carrying a heavier load, or are limited as to what you can lift. A rolling duffle bag is the ideal choice for airlines travel or when traveling long distances. Weekend getaways, overnight trips, or instances where you just need a change of clothes, benefit from a tried and true leather duffle bag. Available in an assortment of natural hues, there's one to suit any taste. Other options in a duffle bag include type of carry handles, organizational features, the style of the opening, and the number exterior pockets. 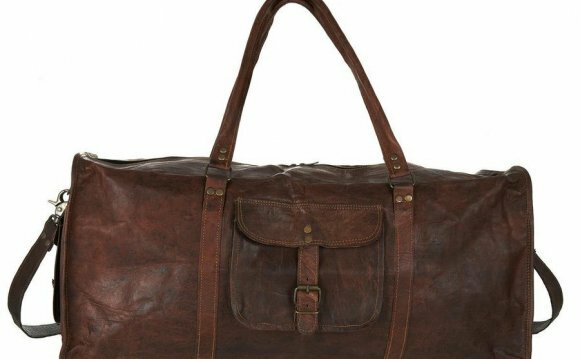 A classic leather duffle bag is always in style, can be used by the whole family, and will only get better with each use. So go ahead and splurge, you can consider your duffle bag purchase a wise investment.